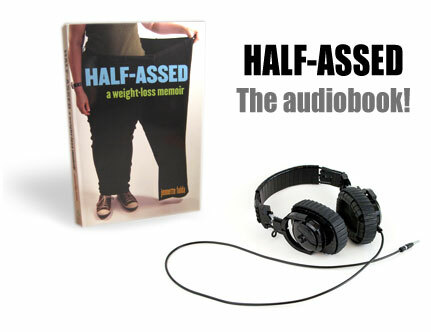 I’m happy to announce that an audiobook version of Half-Assed: A Weight-Loss Memoir will be available at the end of August from Audible.com. If you’ve got 8 hours and 22 minutes free, I hope you’ll consider buying it. Great for road trips! Or for circling the blocks for hours and hours and hours. In a strange coincidence, the narrator of my book, Teri Clark Linden, also narrated my friend Wendy’s book, The Wilder Life. We don’t have the same publisher, so it really is a coincidence. Teri has IMDB page that I’ve been pouring over and I think I might have to watch Jack Reacher now just to see her appearance as the night manager. Also, I learned that “audiobook” is one word, not two. At least that’s how audible.com uses it, so I’m going with them on this one. 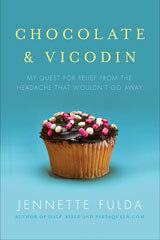 In case you’re wondering, there is not currently an audiobook version of my other book, Chocolate & Vicodin but I hope to have something to announce regarding that by the end of the year. Fingers crossed. I loved your book, and will definitely be buying the audiobook as well! 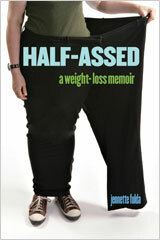 I’m on a weight loss journey now, and found your book so motivating the first time I read it. Can’t wait to read (er, listen?) to it again! @Lindsay @ Lindsay Weighs In – Thanks, Lindsay! I appreciate the support. I haven’t heard the narration yet so I’m excited to hear it as well!